Let’s Nurture, the leading Node.js development company is glad to have a recognition by Clutch platform as “The Best Web Development Company in Canada”. We all are aware about the MEAN Stack and its components. We are the best MEAN Stack web app development company in Ahmedabad, India and with our Node.js development team would like to share some inputs about Node.js installation on different Operating systems. 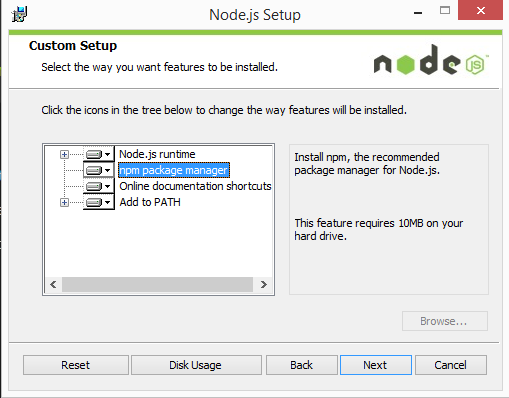 This article will guide you for the Node.js installation on Microsoft Windows and Ubuntu. 1. Download the Windows installer from the Nodes.js® web site. 3. Follow the prompts in the installer (Accept the license agreement, click the NEXT button a bunch of times and accept the default installation settings). 4. Restart your computer. You won’t be able to run Node.js® until you restart your computer. You can use whatever install method of Node.js that you prefer. If your Node.js application needs a specific version, or multiple versions, we suggest using NVM. Otherwise, if the current Node.js version works for you application, using APT is usually fine. Ubuntu 16 has Node.js in its default apt repositories. That version of Node.js can be used to provide a consistent experience across multiple servers. 3. You will also want to install NPM, which lets you easily manage your different Node.js packages. Another way to get the most recent version of Node.js is to add a PPA (Personal Package Archive), which is maintained by NodeSource. If you don’t want to use the Node.js version in the APT repositories, this is a good alternative. 1. Install the PPA. This will give you access to its contents. 2. The PPA will be added into your APT configuration, and your local package cache will be automatically updated. After you run the setup script from NodeSource, you can then use the previous steps to install the Node.js package with APT. Note: The Node.js package contains the Node.js binary as well as npm, so you don’t need to install npm separately. However, in order for some npm packages to work (such as those that require building from source), you will need to install the build-essentials package. Instead of using apt, you can install Node.js with a tool called nvm, which stands for “Node.js Version Manager”. NVM lets you install multiple different versions of Node.js. This way, you have more control over your environment for whatever your project needs. NVM will also give you on-demand access to the latest versions of Node.js, and the ability to use previous releases that your application may be dependent on. This will download the script and execute it. It will install into a subdirectory of your home directory at ~/.nvm. It also adds the essential lines to your ~/.profile file to use the file with bash. Note: This command will pull from the Github Master page so that it is always up to date, but you can use previous versions by finding the URL on that GitHub repository. 5. List available Node.js versions. 6. Install the version of Node.js that you want to use. In this example, the newest version is v7.1.0. If you wanted to install V7.1.0 you can do so by using the nvm install command. If there is a newer version available, use that version. 7. After the command runs, your desired version of Node.js will be installed. Each version of Node.js will keep track of its own packages and uses npm to manage them. Among the all Node.js installation on an Ubuntu server 14.04, nvm method is much more flexible. If you have any queries or doubts then please let us know in comments. We will be happy to help you. Also you can share your knowledge regarding this topic in below comment box.